A Brighton resident who left piles of rubbish on the pavement near her home has been fined a total of £400 for flytipping. Miss Togher claimed at Brighton Magistrates she had left the rubbish because the bins had not been emptied. However, council officers produced evidence which showed her claims to be untrue. Miss Togher was taken to court after failing to pay the £300 fine within 28 days. She was caught as some of the items left, like boxes, clearly showed her name and address. 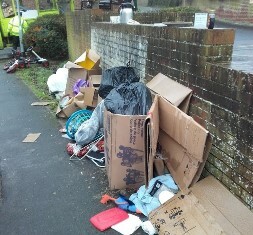 The case was heard in court the day after the council’s enforcement officers, 3GS, launched an investigation into what they described as the largest fly tip in living memory in the city, at Whitehawk Hill Road. In this case 2.5 tonnes of rubbish was tipped onto the street by a dumping truck which cost council tax payers £6,000 to be cleaned up. Cllr Gill Mitchell, chair of the city’s environment, transport and sustainability committee, said: “Both these flytipping incidents show both scales of the problem the council faces in tackling flytipping. “One by a resident who thinks they can simply leave piles of their rubbish on the street and walk away, and another by an organised gang who collect other peoples unwanted rubbish and debris, charge them to remove it and then dump it wherever they want thinking they’ll get away with it. Miss Togher was fined £120 and was ordered to pay costs of £250 and a victim surcharge of £30.